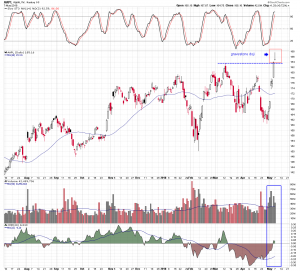 Apple (AAPL) shares rallied over 10% last week to new highs. They gapped higher at the open today and early in the session were up 2.25%. The dynamic changed around noon as Apple pulled back eventually closing near its opening print. Technically, the price action today formed a “gravestone” doji. This is a one-day bearish reversal candle when it forms during a sharp uptrend. A normal doji has a narrow opening and closing range. The gravestone doji does too, but it is situated at the lower end of the overall price range. 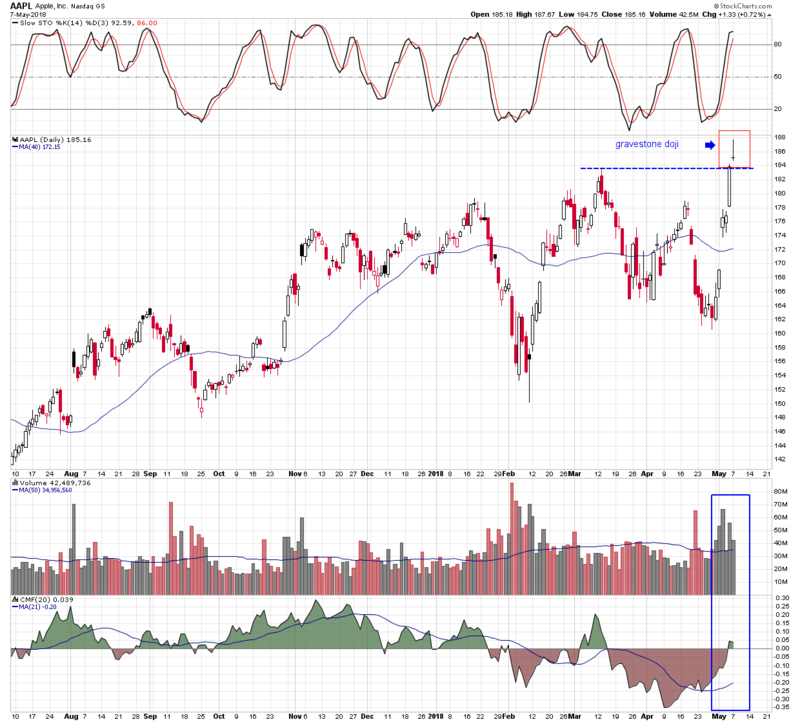 It is considered a bearish reversal sign when it forms during a rally. If Apple were to gap down tomorrow it would create another colorfully named candlestick called an “abandoned baby” candle. This is actually a three period formation, consisting of a large white candle, followed by a gap-higher doji candle, and completed by a gap-lower large dark candle. It is like an eveningstar candle pattern and represents a transition from bullishness to bearishness. But we are getting ahead of ourselves. The pattern first needs to form and there has to be follow-up confirmation. At this point the gravestone doji alone is a rare but fairly reliable reversal candle. Traders holding long positions should remain alert. Resolution Is Near For The S&P 500 Index! 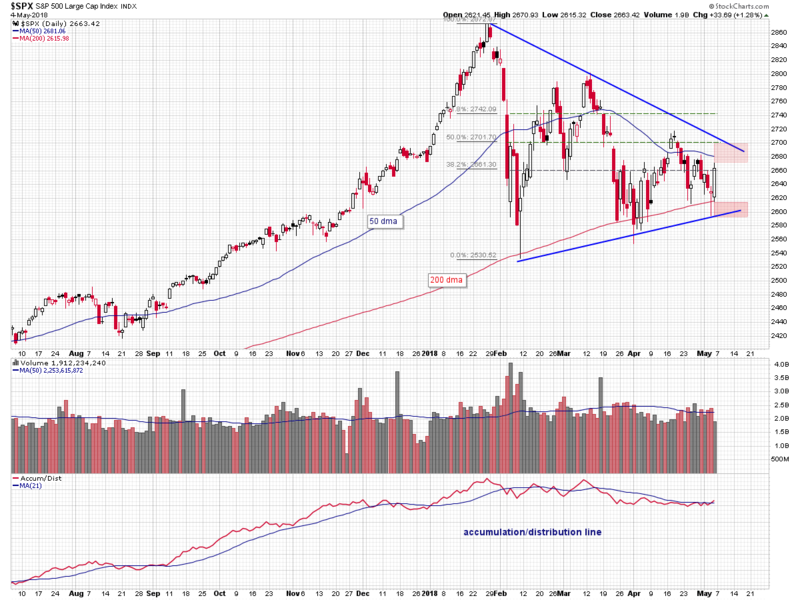 The S&P 500 index has been making a series of lower highs and higher lows since the beginning of the year, forming a large symmetrical triangle pattern on its daily chart. 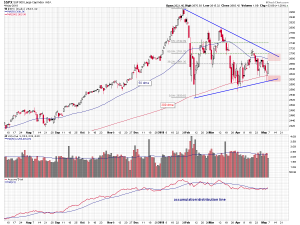 The index is nearing the apex of the declining triangle resistance line and the rising triangle support line. It has also been trading for the last several weeks between the declining 50 day moving average and the rising 200 day moving average. Resolution is just a matter of time, as these sets of indicators converge. Obviously, a break above pattern resistance or below pattern support would be significant and either could determine the intermediate to long term direction of the market.